EEK! I fixed the post... Go while you still can! Wow. I normally try to let the new year pass without much notice because... well let's not get into that. This year however I have to get this post up. Because Beautibi has cool stuff in case you weren't already aware... and this post contains two really cool sets that are only available till the end of 2016. Beautibi wins the award for most amazing stuff I had never heard of for 2016. This shop along with one other are to blame for ruining my blog. Honestly it's hard to maintain my bitter old hag status with so many nice products. I don't even sound like myself talking about them. Thanks. Anyway Enough about me. Let's talk about the stuff you should check out before you miss it! I think the Hyggee products are probably the most talked about in the classic mini set. They were the number one reason I was frustrated by the Classic Beauty Box (the full sized edition of this set.) You see the classic box had two options geared towards different skincare goals. Well... I want ALL the things for my skin! 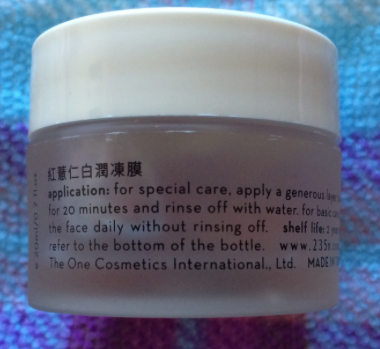 The only product listed with Beautibi at the moment... is the Hygee One Step Facial essence. It comes in two options Fresh and Balance How to choose when I love them both? Is anyone else waiting to see more from this brand? Am I the only person who was really confused by the name? How many steps does an essence usually entail? Of course then I realized that I am one of many probably using more than one type of essence and serum type step in a routine. I think the idea is that this one if you pick the right one will replace all others. Lofty goals man. The Fresh option is clearly not meant for my skin type if you read the full description it becomes even more clear. The only thing on the list of concerns that spoke to me was concern about large pores. I mean... who isn't concerned about pore size? Oh right... people who are less incredibly vain than I am! Anyway the words "chiffon like texture," bifida ferment, lactobacillus, and the mere mention of avocado derivatives in the product made me want to try it anyway! 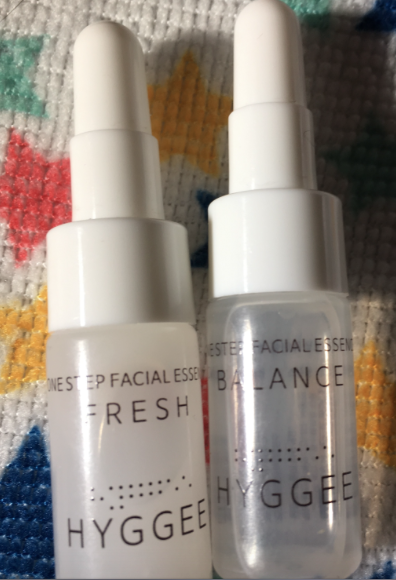 I was completely shocked when I finally saw them both in person and discovered that Fresh was clear while balance was the more cloudy option. I think the richness associated with creams over gel creams and my love of creamy essences have programmed me to think that clear products are not as targeted to dry skin. That isn't to say Fresh skips out on the moisture camp at all! It won't replace a moisturizer for me but it doesn't promise it will. I do have to say though that I don't think I would use Fresh as a standalone product. I break the rules... ignore the instructions and I mix Fresh and balance together. But then I'm puzzled by concept of a perfect oil to moisturizer ratio. What does that mean? Well the product doesn't separate but my new favorite makeup remover does... and I actually think it's cool. 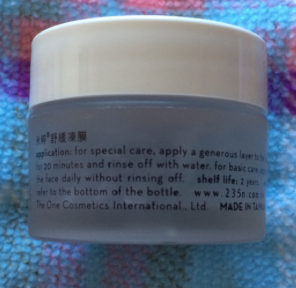 And as I mentioned already it blows me away for some reason that the more moisturizing product is clear! 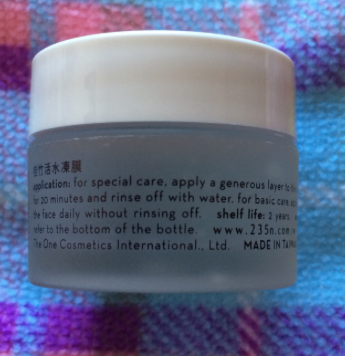 I also mentioned that I like to mix the products and I wouldn't use Fresh regularly alone. The description wins one point I suppose. If I was picking one of the two I would have to go with Balance. However... I prefer Balance mixed with Fresh to Balance alone. Yeah. I do not conform to "skin type standards." That's rebellion for me in my "past my youth state," I guess. Anyway that's why I think the opportunity to try them both in the Classic mini set can't be passed up. It's hard to know which one you will prefer and currently the mini options aren't available individually. Plus the bottles are really cute. I like cute. 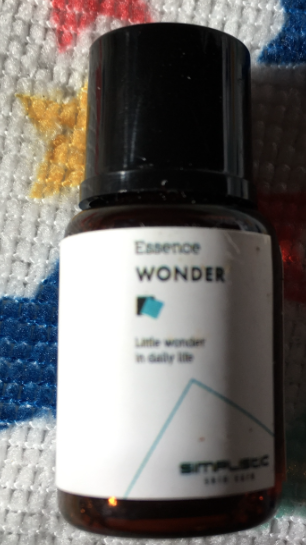 I feel like Simplistic Wonder Essence is the unsung hero of the Classic Box so I'm glad it's available in the Classic set so people can try a little before making a full sized leap. People who pick up the set hoping to try other things might discover they love this too. Like the Hygree minis this isn't available as a single right now and uh... I have no idea if it will be or how much it will cost. I have sort of an obsession with Beta Blucan, Bifida Ferment, Licorice Root Extract, Centella, and well I could go on but based on just these this produce was something I was looking for and didn't know existed. I thought the Hyggee products looked cool enough that I couldn"t pick between the sets and this is the product that made me think grabbing both would be worth it. I honestly didn't think I could own too much of this. I was correct! clearly the product is popular enough to warrant bringing more from the brand on board because the Simplistic Supreme Skin Salve and Simplistic Begin Cleanser have been added to the lineup already! So what is Exciting About Soap? That the On the Soap in question Hydrating Of the options I've tried and it still beats cleansers that advertise being gentle and low PH. So don't ask me the PH right now. 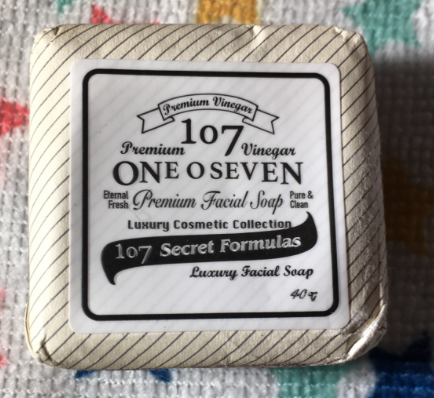 The 107 Premium white mini soap was my intro to vinegar in skincare. I enjoy vinegar covered foods the inclusion didn't make me shy away... although I wouldn't use undiluted vinegar on my skin. Wait for the full review of the full size soap... and yeah I'm going for a full sized soap because I love this one. If it's a higher PH I'm OK with that because it doesn't affect my skin negatively. Although I kind of appreciate this soap as a mini because I cut my soaps up before use to keep as much of a bar untouched by water as long as possible. Lathering up a whole bar of any soap is a waste and this is fancy soap. Fancy soap that I like to use for full body cleansing. The magic of a bar soap (that is well made and you protect from water ,) is longevity compared to liquid soaps. I would describe the scent as unique. I know that's vague but what I can say is that I do not notice that it smells especially like vinegar... and it's the vinegar soap. This shouldn't shock me because the cream and cream essence samples also feature vinegar and not real vinegar scent. It doesn't linger and well.. I'll try to describe it better in my four soap comparison. This mask became a fast favorite. It's thin, it clings well... durable soft material. Leaves my face hydrated and bright and it smells... natural rather than NATURAL! I described it once as smelling like dirt. That wasn't well received. I meant earthy. $3 a sheet isn't really daily use for my budget but honestly it ranks higher than many masks that cost a lot more. This mask is a keeper. I would buy by the box... if I were not so horribly behind on mask reviews. Anyway those are small gripes but you know when a mask is $5 a sheet I get a little pickier. Really late. Look I just hate how my eyebrows look. Yeah I'm that vain. Sue me. 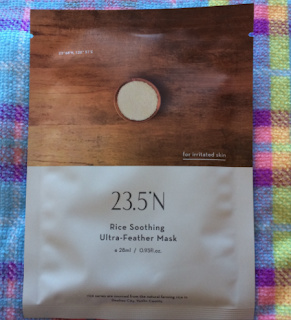 The 23.5N Soothing Rice Gelly Mask and SheetMask are a Pair! I don't have enough of a sheet mask budget to use them together every time. 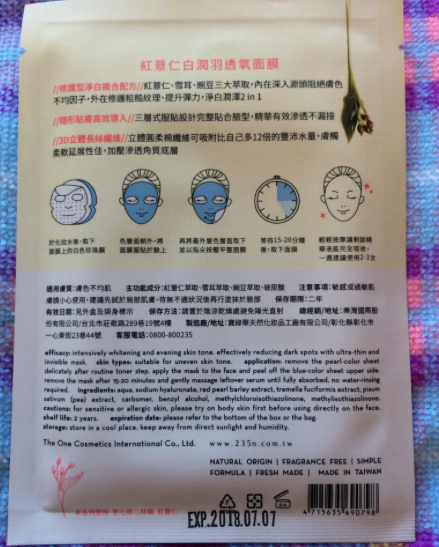 Like the Red Pearl Barely mask I would pick the belly mask over the sheet mask. Again... shocked! 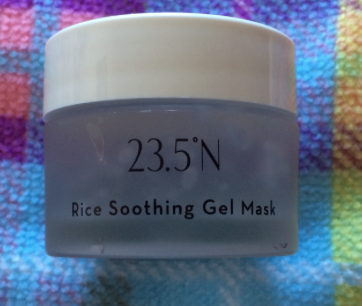 I like the Rice Soothing Mask the best of all the Gelly Masks... at the moment. 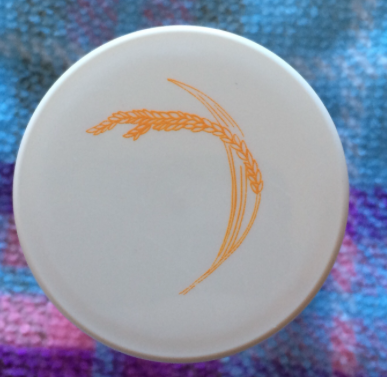 The addition of ceramics (and without the weird ceramide smell of many creams,) just pushes this one over the edge of the others. I would still have a hard time with the idea of eliminating the others now that I've found wash off packs I actually like. In case you haven't read about the others my favorite part is that these don't require rinsing. It's optional! To repeat myself further... I don't personally find these moisturizing enough to follow the "use as a sleeping pack" tip I have a feeling that others with less dry skin could. Especially this one! The rice sheet mask just has more impact on my face with the same brightening level so it wins between the two sheet masks too. Known as "The Grain of Life Health" , red pearl barley is abundant in Vitamin B1, B2. Effectively reducing dark spots, pockmark and uneven skin tone without light-sensitive weakness as acids widely-used in dental treatment. 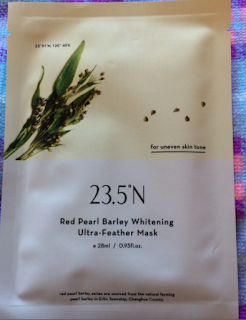 Read Pearl Barley Whitening mask is great for nourishing skin, uneven skin tone and brightening. 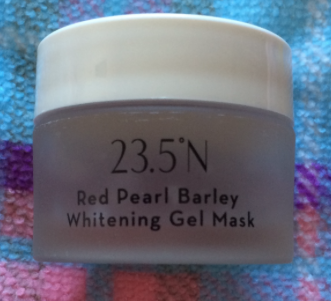 The 23.5N Red Pearl Barley Gelly Mask is like a companion to the Red Pearl Barely Ultra Light Feather Mask. The other Gelly mask that pairs with a sheet mask is the Soothing Rice. 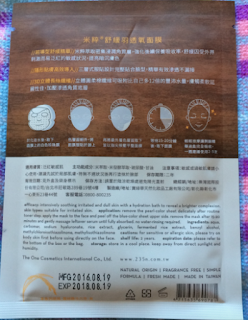 Do the Bamboo mask and Oriental Beauty Masks have a sheet mask partner? Wow I should have asked that before writing this... but hey not knowing the answer gives me a reason to mention them later! To me it just makes sense to pair them together although I tried them individually the first time because I wanted to see if I even liked either product alone. It's weird for me to say this because I'm not typically a wash off pack user but these don't have to be washed off! They can be used as a sleeping pack. I don't find this mask hydrating enough to use alone as a sleeping pack but it is one I enjoy. I enjoyed the sheet mask. It definitely lasted long enough and left my face #bright and #hydrated. I just have so many sheet mask options and masks I want to try that if I had to pick one to keep on hand... well I would go with the Gelly Mask. Weird right? It felt weird to me! That was after getting it in the mask party box. It wasn't the last because I didn't like it. It just happens to have an intended purpose that I focus on the least! I do often forget that calming doesn't have to be for acne. I experience flushing from just about everything and I'm super sun sensitive naturally... and I throw photo sensitizing skincare and prescriptions on top of all of that. Yeah. This isn't a dry out your skin to solve the problem treatment even if you are targeting acne. I think I'll give my next jar a shot in more frequent rotation by adding it to my calendar. I prefer not to wash it off since it can be used as a sleeping pack. For me it isn't enough moisture let alone occlusive enough to be my final layer but I'm desert dry year round. My hands and lips both crack without careful maitainence level dry! I enjoy the cooling feeling. I probably wouldn't use it on broken skin or if you are sensitive to peppermint! 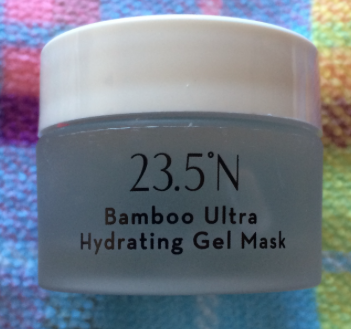 Feel free to express shock and awe as I declare that this is the most hydrating of all four Gelly masks. Yeah... it's in the name. I want to say this is the only product with bamboo that I've used. That isn't true. It's the only product that featured bamboo heavily enough that I remember it that I also enjoyed enough to write about. I know I tried a bamboo sheet mask. I can picture everything about the packaging except the text that tells me the brand name. Clearly the mask wasn't that memorable. 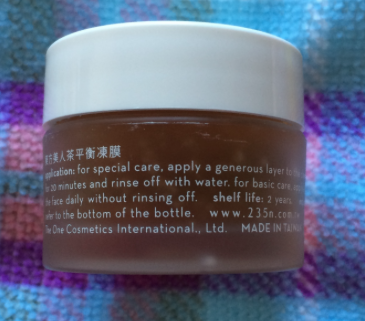 royal jelly is always a nice thing for me in skincare too. (And to eat...) This ties with the Red Pearl Barely Gelly Mask for second place. Yes that means that there is no fourth. My review my rules! In case you skipped reading about the others because this is the ONE you want to know about (because you maybe have dehydrated skin that it's meant to help? or even better you know someone else who does and you know a mini makes the best intro gift? These wash off packs win for me because... you do not have to wash them off. Even this one the most hydrating isn't quite enough to use as a standalone sleeping pack for me even in the hottest days of summer. It's my second favorite because I like the added brightening of the Soothing Rice. That said this mask is my 1 if I'm going in for repair when I've neglected my skin. I can't use it as the only step but in only helps and never hurts when my skin gets ultra dry to the point of sensitivity. This Blog uses affiliate links, referral links, Google Adsense, and is now directly connected to a newly opened shop called Leturos Meloria that contains some of the products reviewed within. All products reviewed after the opening of the shop will disclose if the product was tried before or after the shop came to exist. An affiliate link provides a commission when used. There are many different programs from many different shops. At the moment I have Amazon Associate Links, Wishtrend Links, and Memebox Affiliate links. It does not cost you anything extra to use them! What people may not know... Commissions have a minimum earning before payout. So while I have these links available for anyone to use at the time of this post 11/30/16 I have not actually earned a commission from these links. I plan to disclose earnings if this blog does in fact become profitable. I am not required to disclose earnings but... If I have have any I will because I think it's pretty interesting. A referral link is meant to be beneficial to both parties. They are typically for first time customers only. Memebox get 20% off your first order I believe my link was used one time. I get a code for $10 off that can not be stacked with other codes if this link is used. If I ever get a surplus of these I'll post them to giveaway. I am unsure how exactly commission is calculated. I can say however that for me at least it certainly isn't a huge source of income. There is a minimum of commissions achieved before a payout occurs. At the time of posting (11/30/16.) This blog has never received a payment from Ad Sense and has earned... less than $2 in "owed." If a payout occurs and this blog becomes profitable I will disclose the amounts. This is not required. Only disclosure of the use (which is done automatically,) is required. I just think it's interesting. How am I connected to Leturos Meloria? Well that is a good question and a complicated story. To keep it short: I pick the products and if you buy them I will be the person packing and shipping them out. The shop story itself is much much longer. Am I the shop owner? Not really no. Is this blog to promote the shop/the shop to promote the blog? No. The shop is complicated. It's not huge money making scam. The blog and the shop being connected is unavoidable with open disclosure BUT... they are not meant to promote each other. I’m CanIPutItOnMyFace if you are into Facebook… I’m trying it out. And I'm trying to expand a bit into real youtube videos beyond my ranting. They won't be awesome... but I'll do my best. Laugh at my, laugh with me. It's cool. Check it out. Use Linkedin? I'm Trying it... find me here. Simone Martin.... because that's my name. "I'm taking it back." I am still figuring out Pinterest please send help! "Introducing Sauce du Mois, our monthly special Shark Sauces with fun and exciting additional extracts! 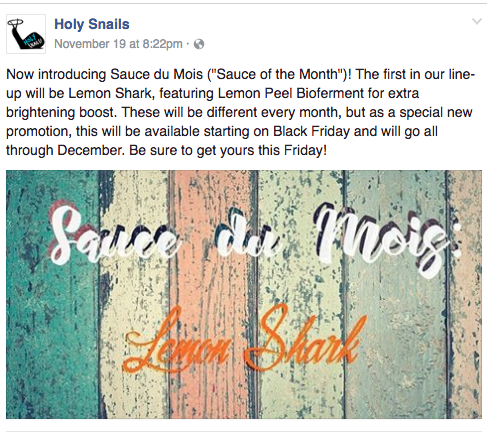 December's Sauce du Mois is Lemon Shark, but to celebrate, we're doing an early release on Black Friday." There will NOW be a featured rotating "Sauce du Mois" or Sauce of the month and it started with LEMONSHARK! Now I'm still pushing for it to be part of the full line.... but really it's too close to shark sauce. Also... I love Lemon Shark but I'm on pins and needles to see what's next. Please tell me there are only like... four that rotate quarterly. I can't... I can't handle the excitement of a new version each month and I JUST ORDERED MEGALADON (I wanted it filled with Lemonshark but... well you know... Rules. "Lemon Shark contains everything regular Shark Sauce does, but also includes Lemon Peel Bioferment, which is used to help with brightening and reducing age spots and irregular skin pigmentation. It is not the same thing as lemon essential oil, and does not photosensitize. The fermentation process is supposed to be filtered to remove allergens, citral, and geraniol, however if you have a lemon/citrus allergy, please consider our regular Shark Sauce instead." "Shark Sauce™ does not contain sharks, shark extract, shark wings, or any other shark derivatives. Its name comes from a nickname of one of our muses, Fifty Shades of Snail, for whom it was originally created." It is honestly important to note that it does not contain sharks though becasue some skincare products use an oil that can be derived from multiple sources... including... sharks. "Shark Sauce™ is a hydrating serum that contains 5% Niacinamide (Vitamin B3) and 3% N-Acetyl Glucosamine, which work together synergistically to fight hyperpigmentation. They, along with Panthenol (Vitamin B5), also work to help improve your skin barrier." "Licorice Root and Green Tea Extracts soothe and brighten skin, while Hyaluronic Acid and Sodium Lactate (the sodium salt of Lactic Acid, a popular AHA) hydrate. The Sea Kelp Bioferment is the result of sea kelp fermented with Lactobacillus, which breaks it down into more bioavailable compounds for your skin to use. 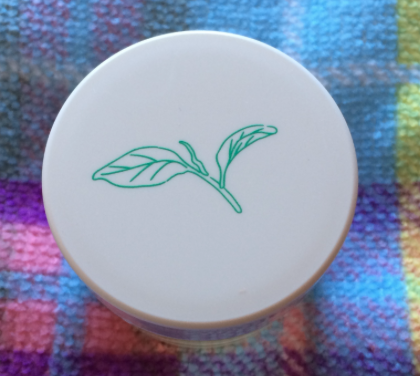 It is a natural film former, and functions as a great oil-free moisturizer." 11/5. MAKE MY MEGALADON LEMONSHARK! Sorry guys no mini versions of the Sauce of the Month... I would make decants if I had enough to share but... I don't know when I'll see it again. $30 for BLACK FRIDAY! then $33 for a 30ml bottle. Now next time snail mail comes... I've missed it every time. I've got my claws out! Like my review and want to save $5 use my referral link! All Holy Snails products come with cool cards like this! The ingredients are on the back. I would include a photo of that but I got mine wet so... It's not pretty. Sorry guys. I'll hand it over to Chel first because her shop description is flawless as usual. My comments follow. "What is El Dorado? Is it a mythical city of gold? A man? A bird? An island in the desert that can only be reached by sail (sail sail)? The answer is simple: it is liquid gold in the form of 7% THDA (oil soluble, stable Vitamin C). Accompanying it is 1% Vitamin E and many rich treasures from the desert, including Prickly Pear, Agave, Yucca Root, Avocado, Jojoba, andEvening Primrose. THDA, or Tetrahexyldecyl Ascorbate, is a very stable form of Vitamin C. It has been shown to stimulate collagen production, reduce photodamage, brighten and even skin by inhibiting melanogenesis, and provide antioxidant activity. It does not exfoliate. This is not a substitute for sunscreen." This product is incredibly unique I had never heard of this form of vitamin C before! Thank You Chel for introducing me to something new to love... again. I love facial oils. I love vitamin C in my routine. Two in one? Sign me up! Sign me up! I also really have to give a shout out to Chel for noting that it does not exfoliate. You want a different type of vitamin C if you are looking to increase cell turnover. She is very clear about what this product does and DOES NOT offer. Also not a sbstitute for sunscreen. Many people mention the benefit of vitamin C serums to boost protection from the sun... even if this is the case... not a sun screen substitute. If you want to skip it... personal choice but she is not advising you to use her product as a replacement. "Suitable for: All skin types. Many Snail Mail testers with Oily or Combination skin were able to use this with no issue, although there was one user with oily skin who reported it had trouble sinking in fully. If you have concerns, please consider a sample size bottle first to see if it is too heavy." Everyone! And I recommend that if you want a sample size... you check out a giveaway I have going on because there might be one popping up on the prize list... I personally have no issues with it sinking in within seconds. Even when I made my little mistake with my first use... Even with multiple moisture layers under it (but not an occlusive step... where it goes in the routine is explained in "how to use." I have very dry skin though so YMMV. Samples are cool. Holy Snails offers them for a reason. Although... Her products are NOT hard to destash if you jump in fora full size and find you don't love it. "Please always patch test any new products. Our products have very concentrated ingredients, so please patch test to make sure you do not have any sensitivities to any of them. This product does not cause purging, so if you experience breakouts or irritation, please discontinue use. There is a Sample/Travel Sized version to try if you are unsure of your ingredient sensitivities." The product description page even warns you to check out the list for sensitivities, patch test, and try out the product slowly. Good advice man. Good advice. "How to use: Both of the carrier oils used in El Dorado (Avocado and Jojoba) are occlusives, so they should be used near or at the end of your routine. It can be used in place of, before, or after your moisturizer, but to get the maximum benefit of the 7% THDA, it is not recommended to mix it with other oils or moisturizers. If you are using other Holy Snails products, the product layering order would be Snowbang Essence, Shark Sauce, and then El Dorado Oil Serum." "This product does not contain any photosensitizing ingredients, but the most vital and effective anti-aging step in your routine will always be sunscreen. Please note that while this has photoprotective properties, it is not a substitute for proper sunscreen. Please always use (the correct amount of) sunscreen for best results in fading hyperpigmentation. This product is not intended to diagnose, treat, cure, or prevent disease. Always consult with your professional skin care provider. It does not have any fragrances." See I told you all would be revealed! Again she repeats that it is not a substitute for proper sunscreen. Thank you for being so thorough. I use um... A few more things than just Snowbang and Shark Sauce (lately it's been Lemon Shark... Then Holy Snail Water Actually,) before my El Dorado... but yep it doesn't go on before. And unlike some oils I wouldn't use this as a "booster" for a sheet mask. For my skin it's not going to work in place of a moisturizer. I'm a bit too dry. I actually like it as a mid day routine step. If I'm not doing a full routine but I need to refresh... The right cleansing water and some El Dorado are part of my "perk up" recipe. This is one pump. You can barely see it because it's clear. One pump is decent face/neck coverage for me technically but I'm greedy and I like to use two. For most people one is plenty. How she found pumps so well calibrated I will never know. So I kept on pumping out more and more trying to figure out what it smelled like because I assumed it just really really didn't linger. My body got a treat. My bottle would have lasted longer had I not done that... and shared some with a few friends because I couldn't resist. Still even with my mishaps and sharing I got a full month of testing with no problem. Then I got more testing time without an a standard vitamin C serum (nope it's not a substitute.) I went without it in my routine... nope... I didn't like that either. It's an oil that brightens. It doesn't have a scent so I can use it no matter how I'm feeling. It feels good on my skin no matter how poorly I've treated it. It quickly sinks in and smooths my face out in a pinch... while adding benefits. Yeah that day I covered my body in it by accident? If I were rich this would be right up there with Snow Bang and Manyo Factory Galatomyces Niacin Essence for Full Body use daily. 5/5! I am a not loyal to vitamin C serums OR facial oils. This though... does not force me to cut out either from my routine. I've gone without it and noticed a difference I did not like. 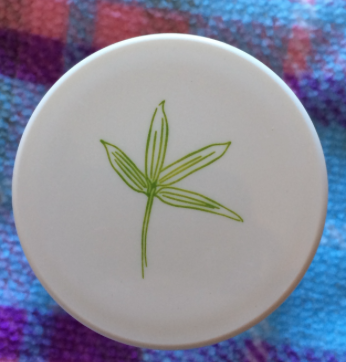 I was just about to crack into the sample size I purchased for my giveaway since no one knew about it anyway (actually I was just going to reorder,) when... The announcement came! The formula is being updgraded to 10% THDA instead of 7%. Available starting on Black Friday... That's TOMORROW! Stay tuned for a follow up post guys. 1- I want both my money and the time I spent using this product back. It should never be used and if I encounter another in my collection it goes to the trash bin.2- The product is nothing special but not horrible. I would use it again or give it away if I got it as a free sample. 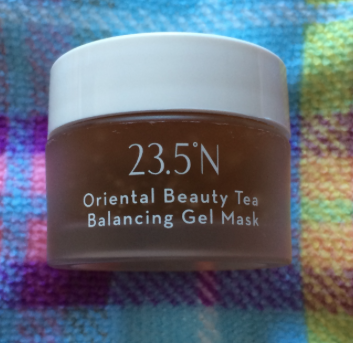 4-I really like this and would likely repurchase if I do not find something better. 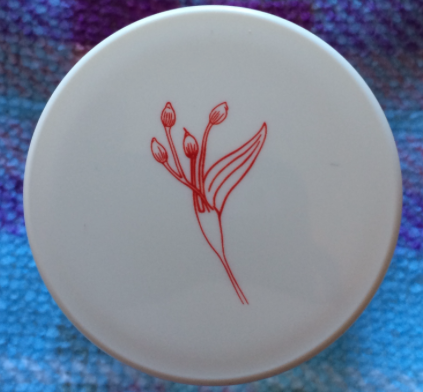 5-I love this product and it has become a staple in my collection. So now you know what the numbers mean!